What is vein ligation and stripping and who needs this type of surgery? This is a minor procedure. It removes the damaged parts of the veins and correct the complications that damage veins create. In some cases, the veins are severely damaged, or beyond repair, the veins are considered stripped. The doctor takes a flexible thin threaded shaped devices and makes an incision in the vein. The instrument grasps the damaged veins and removes. 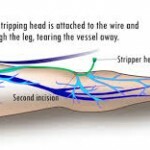 More than one incision is made, and during the procedure, the damaged veins are sectioned off, and tied. Health veins underneath the damaged valves are left intact, so they can continue to allow blood to circulate through the other healthy veins. Hospitalization is not necessary, and can be completed as an outpatient surgery. Patients may require general or regional anesthesia. Some people are able to go home the same day, following their surgery. Most people can return to work in only a few days, but are not able to return to their full normal activities until a few weeks. Is Ligation and Stripping Necessary? Yes. If the veins are large, this can be an indication of varicose veins. The procedure can prevent the formation or the return of skin ulcers within the veins. The surgery is performed when any of these problems exist. Open sores or ulcers, due to poor or reduced circulation of blood in the veins. Parts of the vein are damaged, in areas such as the knee and groin where the deep veins connect with the superficial parts of the veins. For non medical reasons, such as cosmetic and appearance reasons, and not health risks. Swelling, aching, and heaviness of the legs are increased due to prolonged periods of standing. In smaller varicose veins stripping and ligation is not necessary; other treatment options are available.